I needed to bind a nullable DateTime to a Winforms DateTimePicker control. Unfortunately, the standard DateTimePicker only supports regular DateTime objects. I looked around and found some controls that other people had built, but none of them did exactly what I needed. I wanted a control where, if the checkbox is unchecked, the value is considered null and the box is blanked out. I couldn’t find one like that, so I built my own. The first one I built was written in VB.Net. In this blog post, we'll create a C# version. We start by creating a new class and having it inherit from DateTimePicker. Then add a nullable DateTime property to hold the binded value. In the constructor, we set the ShowCheckBox value to true because we want it to always be visible. Then we set the format type to custom. Notice we also add handlers for the Format and Parse events. In the Format handler, we check to see if the date is null. If it is, we set the custom format to be a blank string and un-check the check box. Otherwise, if there is a date, we set the custom format to MM/dd/yyyy and the check box to checked. The Parse handler checks to see if the checkbox is checked. If it is, is sets the value. Otherwise is sets the value to null. Finally we need to override the OnValueChanged event. Here we set the BindedValue property to the value that was entered. Then, if the checkbox is checked, we set the custom format to MM/dd/yyyy. If it’s not, we make it blank. If the box is un-checked, nullableDateTimePicker1.BindedValue.HasValue will return false. But if the box is checked, we can get the selected date from nullableDateTimePicker1.BindedValue.Value. For the icon theme, select Legacy if you want icons like they were in 2.8. If you'd like color versions of the new icons, select the icon theme named Color. Additional information: The visual tree has been changed during a 'VisualTreeChanged' event. At first, I thought it might be related to the issue VS 2017 caused with VSIX projects. But this was a different error. After Googling, I discovered here that you could fix it by disabling Enable UI Debugging Tools for XAML. Tools --> Options --> Debugging --> General --> Uncheck Enable UI Debugging Tools for XAML. The other day I wanted to create a Visual Studio Toolpane window and I wanted to create it using Winforms (by default, the toolpanes use WPF). I've tested these steps with Visual Studio 2015 & Visual Studio 2017. In Visual Studio, from the File menu, select New --> Project. In the New Project dialog, one the left, under Visual C#, select Extensibility. On the right, select VSIX Project. In the Add New Item dialog, on the left, expand Extensibility and select VSPackage. On the right, select Custom Tool Window. Drag a label to the control so we can see something when we run it. Change the Text property. 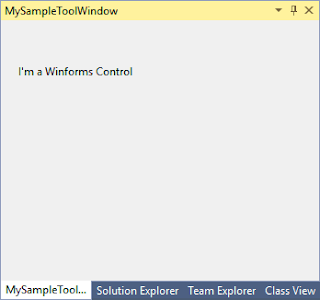 In this example, I changed it to "I'm a Winforms Control". Add a field to the MySampleToolWindow class. Make it of type MySampleUserControl and name it control. Then comment out the line that says "this.Content = new MySampleToolWindowControl();"
Under the commented out line, add a line to create an instance of our control. Add a using System.Windows.Forms; statement at the top of the code. Now we can run the project. In the experimental version of Visual Studio that opens, from the View menu, under Other Windows, you should see our window ("MySampleToolWindow".) Click it to open our window. It opens in a window by itself. That's great. But what if we want it to open already docked to the Solution Explorer panel? "The first named parameter is Style and its value is Tabbed, which means that the window will be a tab in an existing window. The docking position is specified by the Window parameter, in this case, the GUID of the Solution Explorer." At this point, you can optionally delete the MySampleToolWindowControl.xaml file. 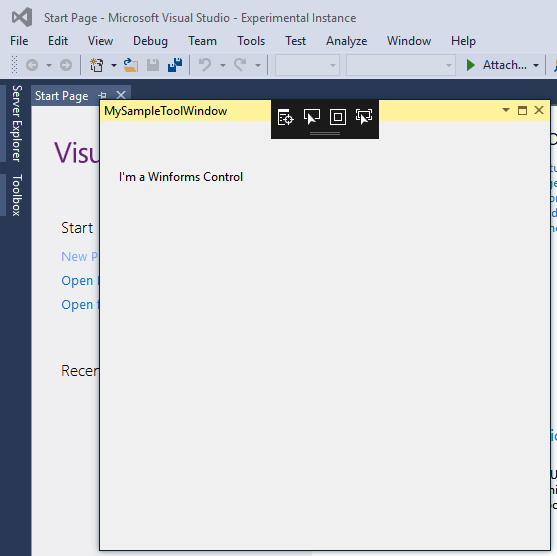 This is the WPF control that we're not using. Yesterday I opened up a VSIX project to add a new feature. This is a Visual Studio 2015 project that I hadn't worked on in a few months. It worked fine a few months ago, but now, all of the sudden, it wouldn't build. What's going on? "Cannot find wrapper assembly for type library "EnvDTE100". Verify that (1) the COM component is registered correctly and (2) your target platform is the same as the bitness of the COM component." "In old VSIX projects: Remove old COM references to EnvDTE, EnvDTE80, EnvDTE90 and EnvDTE100. Add new references using Assemblies | Extensions tab and select EnvDTE, EnvDTE80, EnvDTE90, EnvDTE100. The project should build now." I updated my references and everything started working again. I needed to delete some files from source control and noticed that it was taking Visual Studio/TFS about 30 seconds to delete a file (move it to the delete pending list). Since I needed to delete a lot of files, you can imagine how annoying this was. So, I fired up good old Process Monitor and started watching devenv.exe. Then I went into Source Control explorer and deleted a file. Suddenly Process Monitor was full of folder accesses. Dozens of folders were being scanned. After some research, it turned out that when I deleted a file for some reason Visual Studio was looking through all the folders in the same workspace as the file. So, I created a new workspace and put my project and only that project in the workspace. Now when I try to delete a file it happens very quickly.